The course offers a fascinating look at how to address problem solving and corrective action. Discover how to apply the NTSB's methods of problem solving within your own organization. Eagle Force has developed a unique, highly intuitive approach that will help you easily identify problems, solve them and make sure they don't happen again. This is one course you don't want to miss! A Corrective Action system that actually works. Finally! We've seen our system work across the country from military installations to private organizations time and again. Our clients love the results and so will you. We guarantee our Corrective Action system will work for you or we will refund 100% of the money you spend on the course. 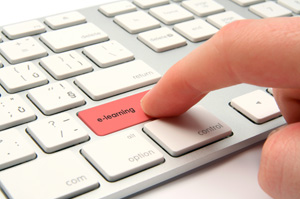 Our extremely popular corrective action training is now available online! We are very excited to deliver this highly sought after course. The “Corrective Action Process Made EZ” course is based on over 50 years of experience in effective solving problems and the process the National Transportation and Safety Board (NTSB) has used to make airplane travel extraordinarily safe (21 times safer than auto travel per passenger mile). Auditors are beginning to write more findings because most corrective action processes are not working as required. All management standards (ISO 9001, IATF 16949, AS9100, AS9110, ISO 14001, ISO 13485) require a functioning corrective action process to preclude problem recurrence. This “Corrective Action Process Made EZ” course provides the guidance to meet the management system requirements and solve problems to continually improve your organization. Most corrective action systems focus on finding the cause of a problem. But they don't even do that very well. Watch the video to discover how our system goes beyond simply finding the cause and teaches you how to perform the 3 primary steps to finding and fixing problems permanently. "This isn't something you do just to fill out a corrective action request to please an auditor. This really works!" We're so confident you'll love this system that we're willing to offer a complete refund if you're not satisfied for any reason. Complete satisfaction or a complete refund. It doesn't get any simpler than that. We know you'll love this corrective action system. Watch the video to see why. This course doesn’t just present you with an amazing corrective action system. It actually teaches you how to use it yourself. You’ll learn how to implement it, what the 5 primary roles of a corrective action program should be, and the application/interaction of each of these roles. All of this backed by our money-back guarantee. Watch the video to learn more. Explanations of the management system requirements for Corrective Action and Preventive Action. Detail coverage of the Corrective Action Model steps and related problem solving tools, with examples. Describing the Problem – Tools including “Is/Is Not”, etc. Identifying the Problem Cause – Tools including the Process of Elimination, Root Cause, 5 Whys, Strategic Business, etc. Determining Appropriate Action to Eliminate Problem Cause – Tools including Creative Problem Solving, Priority Mapping, etc. All of this is presented in an easy to understand and entertaining manner, that includes the use of many unique graphics and examples. 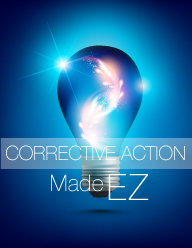 The “Corrective Action Process Made EZ” course can help you and your organization solve problems that are impacting your operation and customer satisfaction with a corrective action process that employees will like.